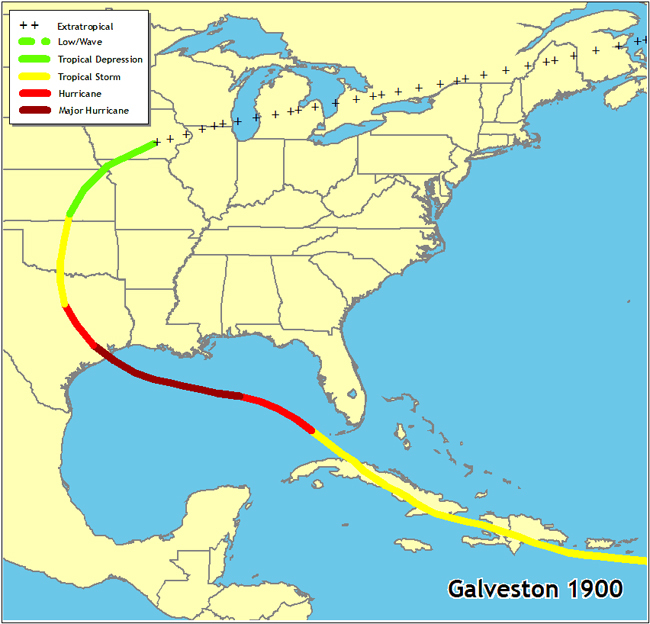 The worst natural disaster in American history occurred on September 8, 1900 when a massive hurricane hit Galveston, Texas. At the time, Galveston was the largest city in Texas and one of the most prosperous in the country. Weather forecasting was not keeping pace with prosperity, however, and the folks in Galveston had no way to know what was about to hit the island. In part 1, you’ll learn about victorian-era Galveston and the weathermen who thought they understood hurricanes. This episode will take you through the morning of September 8, a day that changed Galveston, and Texas, forever. Thanks very much! Please share the show with your friends. I am fascinated with the history of the Great Storm of 1900. I have read several books and have seen the movie in Galveston on the storm. I really enjoyed this podcast especially the extra commentary on how the island looked at the time, what life was like on that Saturday and points of reference on their homes. Thank you!! P.S. I was directed to the podcast from The Bryan Museum’s Facebook page post. I’m not sure what to put in the Website box. Thank you very much! I hope you will share the show with your friends and like the show on Facebook. You can also follow on twitter and instagram @wiseabouttexas. Look for part 2 coming next week!